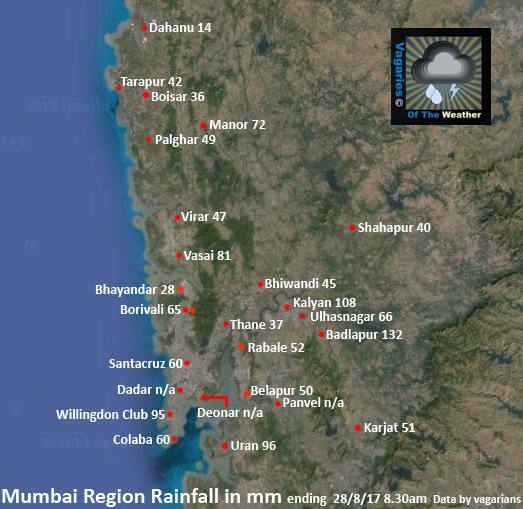 There was substantial increase in rainfall in Mumbai on Monday. Though varied, it was extremely heavy and more widespread in South and Central Mumbai. 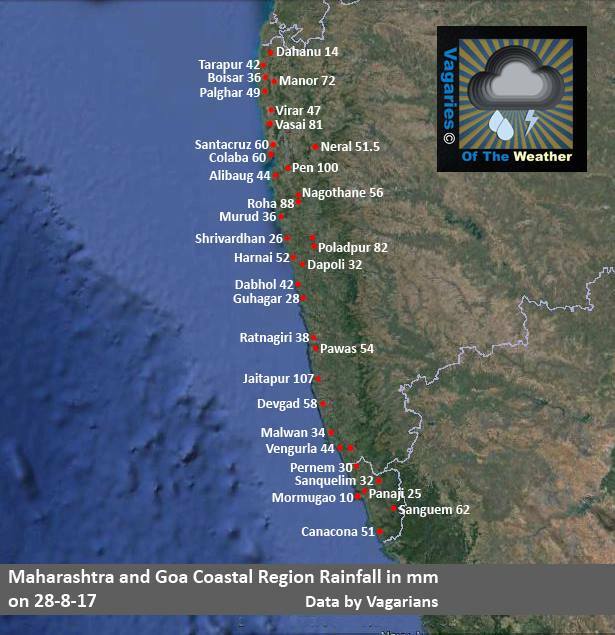 During the previous (Sunday night), Colaba recorded 60 mms each. During the day (Monday), Colaba recorded 125 mms from 8.30 am - 8.30 pm and Scruz recorded 33 mms in the same time frame. In the same period, Rainfall of some Mumbai gauges in 12 hrs Monday: Municipal Office measured 113 mms, Vagaries' station at Mahalaxmi (Central Mumbai) recorded 105 mms, NanaChowk 69 mms, Vikhroli 51 mms, Matunga 52 mms. (Vagaries had estimated 70-90 mms). Mumbai will get frequent and intermittent heavy showers on Tuesday also. Very windy conditions likely during showers. Amount may be same as Monday, may vary in different areas of city. Rainfall decreasing from Tuesday night. Surat recorded a heavy rainfall of 108 mms on Monday (Day time 12 hrs)..(more than our expectations of 65 mms.) Bhavnagar 63 mms and Valsad measured 36 mms. Surat will see less rains on Tuesday, though there will be occasional rain showers on Tuesday. Quantum will be less than Monday. Indore measured 47 mms of rain as on Monday morning...a few showers upto 20 mms for Tuesday. Raisen recorded 77 mms. As we mentioned, the system re- emerges in the Arabian Sea and tracks NW towards Kutch and Southern/coastal Sindh. We can expect thunder showers in Southern Sindh and Karachi. Karachi: Wednesday will see thunder showers and possible showers continuing into Thursday. On Wednesday/Thursday and Friday, Karachi may get an accumulated 55-70 mms. Mumbai will see an increase in rainfall on Monday 28th and Tuesday 29th. Frequent intermittent showers, heavy, will make it a rainy day, cool and windy. Would expect around 70-90 mms per day. Very windy on Tuesday. Heavy and very frequent rains for the Roha - Nagothane region on Monday and Tuesday. Pune will see a cold and rainy day on Monday and Tuesday. Day's high will be 23/24c, with around 20-25 mms per day. Surat will see frequent showers, some heavy next 2 days. Around 45-65 mms per day could be expected. Maybe accompanied with thunder. As mentioned, the "pulse" from the system BB-8 (Low) has travelled West, and is embedded in an elongated trough (East-West) from South M.P. to Eastern parts of Gujarat. This is the region we see heavy rainfall occurring. 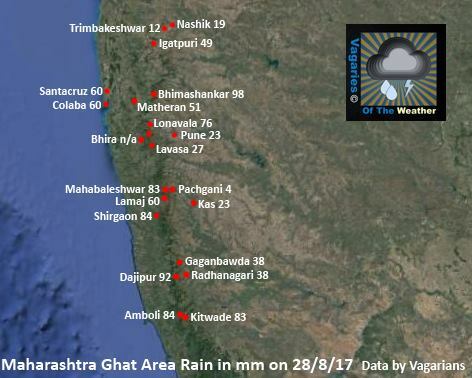 Heavy rainfall and thunder showers in South MP and Eastern Gujarat regions. The Pulse will move West in 24 hrs...Seems could move towards Mumbai/South Gujarat...next update on Sunday night 11.30 pm IST. Thanks Rajesh Sir for the update. Thanks for the update.. It was almost a dry day for Mumbai today.. Let's see, things might get interesting in the next 24 hrs. Sir can u forecast for rajkot(Gujarat)? Bcoz all forecast models shows different amount of rain. Mehul: I would forecast rain in Rajkot to increase from Tuesday 29th...Tuesday will see around 20-30 mms...i could be wrong. Heavy rains have started in vasai ..its pouring here since 10 mins .quiet windy with mild thunder . There is some lightning in mumbai sky right now. Thundering in santacruz but no rain. Thanks sir.. Hope for the best... Farmer needs one more good spell. Rajesg sir,its raining as per your forecast...,,,torrentially and disastrous .....what kind of wind speed do you expect in Nagothane tomorrow?I know that Mumbai would get more gales than interiors..
What about western mp,,, indore region? In rajkot we received around 50 mm in just few minutes. Its looks like new year celebration fireworks in sky. Torrential rain water falls over belapur/navi mumbai. Last few years of observation has seen excess rains over MAHA and GUJ west coast but most worrying factor is decreasing rain over Kerala/waynad and coastal Karnataka, malanad, kodagu due to which Cauvery is consistently lacking heavy spells. In fact in KER we have not seen even a single spell (> 200mm) since june! Some change in climate /anamoloy. GUJ is becoming like Hurricane Harvey! Wow 350 mm plus rains since monday till tonight possible. Any latest update on Forecast Rajesh? The Indian Ocean Dipole (IOD) is neutral, though index values have generally been above zero for the past several months. Most climate models suggest a neutral IOD is likely to continue. However, two of the six climate models surveyed suggest a positive IOD may develop during spring. Positive IOD events are typically associated with below average winter–spring rainfall, and increased spring–summer fire potential over central and southern Australia.